The long-running Memphis Film Festival, held June 17-19, 2004 had something different for its 31st installment. This year, Ray Nielsen and his organization added a tribute to the films of Charlie Chan, the brilliant Oriental detective. With the exception of Sherlock Holmes, Charlie Chan is the most prolific detective on film, with a filmography that includes an initial 10-part serial in 1926 followed by 46 films until 1949. One of 20 badges specially made to commemorate Charlie Chan. 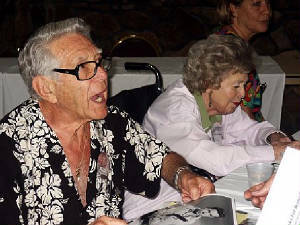 The unofficial "Chan Fest" featured the screening of six films and included the appearance of four Chan alumni: Noel Neill, who is best known as Lois Lane in the Superman films and TV series; Joel Marston, who appeared with Noel Neill in Sky Dragon (1949); Rita Quigley (The Trap, 1946); and highlighting the quartet was Layne Tom, Jr., who played the roles of three different Chan sons. All four Chan stars, as well as the other 13 guest celebs, were available to chat with fans, pose for pictures, and sign autographs during the Festival's three days. Sensing the popularity, several dealers brought along memorabilia for sale. Although the Memphis Film Festival officially started on Thursday, the Chan Fest events were scheduled on Friday and Saturday. There were no Charlie Chan events scheduled Thursday and I took advantage of the opportunity to visit the dealer's area and meet many of the guest stars. 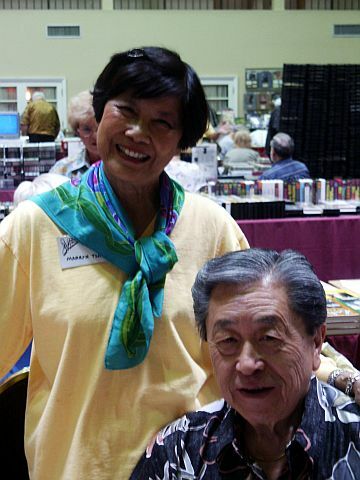 Because I had written two books on the Charlie Chan films, the yearning to meet Layne Tom, Jr., who was making his first appearance at any film festival, was at the top of my list. I was honored to have lunch with him and his lovely wife Marilyn, whose aunt (Jean Wong) had appeared in two of the Charlie Chan films. Both were gracious hosts..
Thursday evening's entertainment featured actor John Calvert, who once appeared as Michael Waring, a.k.a. "The Falcon" in three films following real-life brothers George Sanders and Tom Conway. Very dapper at 92 years young and assisted by Tammy, his lovely wife of 40 years, Calvert is now known as the "Dean of Magicians" and entertained the audience with a selection of his well-known illusions. Among these were his famous "cigarette production" routine, the 100-foot rope escape, and the double wrist tie. Layne Tom, Jr. and his wife Marilyn. During the performance, I bravely volunteered my wrist watch which Mr. Calvert then appeared to have smashed into hundreds of pieces, scattered all over the stage. Charlie Chan fans would recall a somewhat similar situation mentioned in Charlie Chan at Treasure Island, when Charlie Chan remarks to the magician Rhadini (played by Cesar Romero) that Rhadini had once borrowed a watch of his during a show in Honolulu and returned it in many pieces. Fortunately for me, Mr. Calvert returned my watch in perfect working order. As a magic neophyte myself whose only skill is being able to cut a deck of cards with one hand, Mr. Calvert was gracious in providing helpful advice to me after the show. Friday's Chan Fest schedule first saw the screening of Charlie Chan at the Olympics (1937) featuring Layne Tom, Jr. as Charlie Jr., Chan's #2 son alongside Warner Oland as Chan and Keye Luke who played Chan's #1 son. In this film as an impish 10-year old, Tom is best remembered for his comical obsession in attempting to track down a female suspect who wears a white fox fur. This film was followed by the showing of Charlie Chan in Honolulu (1938), where Tom was now cast as Charlie's number #5 son, Tommy Chan. "Honolulu" was the first film for Sidney Toler in the role of Chan following Oland's death as was for Victor Sen Yung as #2 son Jimmy, following the departure of Keye Luke from the series. Sky Dragon (1949), which was the last film of the Charlie Chan series, was also shown. The film's cast included guest celebrities Joel Marston and Noel Neill who appeared alongside well-known supporting cast members such as Milburn Stone, Lyle Talbot, and Elena Verdugo. The fourth film of the day was Charlie Chan at the Race Track (1936), which featured Alan Dinehart, the father of guest star Mason Alan Dinehart III, himself an actor. Friday afternoon featured a panel discussion with the Chan foursome of Noel Neill, Rita Quigley, Joel Marston, and Layne Tom, Jr., and was moderated by the knowledgeable Michael Fitzgerald. Besides giving their recollections of the Charlie Chan films and answering questions from the audience, each discussed how they got into acting, talked about some of their other films, and their current activities. 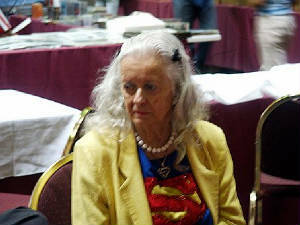 As would be expected, Noel Neill spoke about George Reeves and her role as Lois Lane in the Superman series. "George did not like to exercise," Miss Neill remembered in response to a comment from the audience that he was a bit "paunchy." She currently works for actor Tom Selleck, handling his fan mail for the last 20 years. Rita Quigley conceded that she will probably never shake off the reputation of her being known as the hysterical screamer in The Trap, her final film right after she got married, now having six children (four previously died) with 12 grandchildren. She also talked about what happened to "Baby Jane," her real-life sister, child actress Juanita Quigley. Joel Marston and Rita Quigley at the one of the guest celebrity tables. Miss Quigley also mentioned that no one suspected that Sidney Toler was ill while making The Trap, his final film which was completed a few months before his death. She also recalled what it was like to go on a "date" with Mickey Rooney, which was really a well-chaperoned publicity function. "There was nothing serious between us," she remarked. Joel Marston recalled how he grew up in Washington, D.C. watching early Charlie Chan films with Warner Oland, as his father was a vaudeville theater musician. To those in the audience, Marston admitted, "In a lot of these pictures, people think it's fun to make these. It's hard work! I mean, you get up early in the morning and work all day long, climb trees, ladders, and ride horses." He thanked all movie fans because, "As actors, we are only seeking love and you give it to us and we appreciate it." Marston also appeared on the stage including six on Broadway and he now keeps in shape, working as a water aerobics instructor three time a week in Jacksonville, Florida. 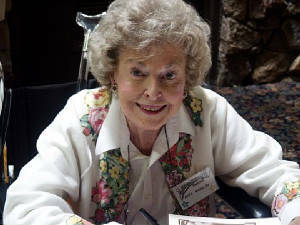 Noel Neill, a.k.a. "Lois Lane"
Layne Tom, Jr. has the sole distinction of playing three different Charlie Chan sons, and probably generated the most interest during the panel discussion. When as a young child, he got his start in entertainment literally as a song and dance man, singing of all things, "When Irish Eyes Are Smiling!" Tom also gave his recollections of appearing with child star Shirley Temple in Stowaway (1936), with Dorothy Lamour, Jon Hall, and C. Aubrey Smith in The Hurricane (1937), and as an uncredited extra in San Francisco (1936) that starred Clark Gable, Jeanette MacDonald, and Spencer Tracy. Layne explained when he got out of the Navy following World War II, he turned down a five-year movie contract with Monogram to go to college instead to become an architect, a profession he retired from about nine years ago. Tom, Jr., Mason Alan Dinehart III, Sally Fraser, Jim Kocher, and Ray Nielsen. He revealed that the making of The Hurricane was done on an indoor set and he marveled how the "hurricane" in the film was man-made. He also explained his feelings about Fox Movie Channel's abrupt cancellation of its airing of Charlie Chan films last Summer because of protests from some Asian groups. When asked if he felt that the Charlie Chan character presented a negative stereotype of Orientals (now Asians), Tom responded that, "It was all a bunch of nonsense." The entertainment for Friday evening continued the Memphis Film Festival's tradition of the presentation of a radio show recreation complete with sound effects and organ music. This year's production was an episode from The Falcon series, "The Case of the Murdering Misses." John Calvert reprised his role as Michael "The Falcon" Waring and the rest of the cast included Festival stalwarts Ray Nielsen and Jim Kocher along with guest celebrities Ed Nelson, Rita Quigley, Mason Alan Dinehart III, Sally Fraser, Joel Marston, and Nancy Saunders. This episode would be special in that the script was specially rewritten to include the part of Charlie Chan, played by Layne Tom, Jr.
Saturday's offerings first featured the screening of Charlie Chan's Murder Cruise (1940), Layne Tom Jr.'s appearance as Willie Chan, Chan's #7 son. Following the film's showing, I gave a presentation with a slide show on "The Who's Who of Charlie Chan's Family." The final Charlie Chan film screened was The Trap (1946), which included Rita Quigley, and was Sidney Toler's last film before his death. All the Charlie Chan films were well attended with some venues even bordered on standing room only. his hosting the Charlie Chan Message Board, an internet discussion site since 1995. The Memphis Film Festival concluded Saturday night with an awards diner. 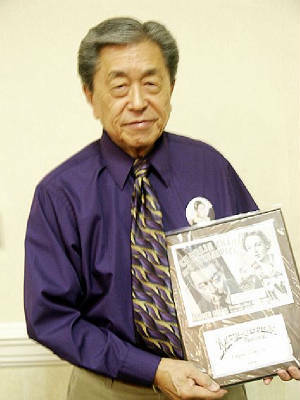 Following a buffet dinner, specially made plaques that featured the reproduction of a lobby card that represented a film of each guest were presented to the guest celebrities. In accepting her plaque, Rita Quigley praised Sidney Toler's acting, calling him a "very nice man." When his turn came, Layne Tom, Jr. emotionally remembered his cousin Virginia Quin Kay, who had only passed away the previous month, and she would have been proud to be here. Virginia was an avid fan of the films, as her mother (and Layne's first cousin) played Charlie Chan's #1 daughter in one film, while her uncle, Richard Ung, and cousin Barbara Jean Wong also appeared in several of the Charlie Chan films. Layne Tom, Jr. proudly shows off his award plaque. 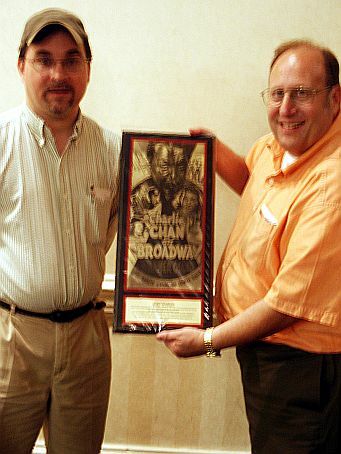 Besides the plaques awarded to the guest celebrities and many of the people affiliated with the Memphis Film Festival, a special plaque was awarded by Jon Kaplan, on behalf of many Chan fans, to Kurt Schmidt, the host of the "Charlie Chan Message Board," a non-commercial, internet open discussion site that has linked Charlie Chan fans together since 1995. 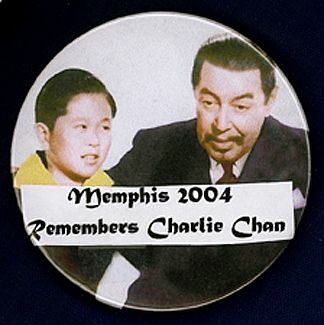 For the Charlie Chan fans who were in attendance, the 2004 Memphis show was indeed one to remember. ©2004, Howard M. Berlin. All Rights Reserved.